Eo is a commission for bass trombone and tape. It explores aspects of temporal space and because the soloist records three alternate bass trombone parts to make the tape, the piece is performed by the performer and their former selves simultaneously. Inspired by the Sun's favorite tv show "The Flash", Eo is the final piece on Sun's upcoming solo bass trombone album Tachycardia. As a Performer, Mr. Sun has played with numerous ensembles around the world, including China National Symphony Orchestra, Hang Zhou Philharmonic, Guang Zhou Symphony, Oak Park Symphony, the North Shore Chamber Orchestra, Logos Symphony, Pennsylvania Philharmonic, Lakefront Low Brass Quartet, and other. He also toured Asia with Lakefront Low Brass Quartet in 2012. He frequently performs solo recitals in both Asia and America as well, often performing new music by living composers. 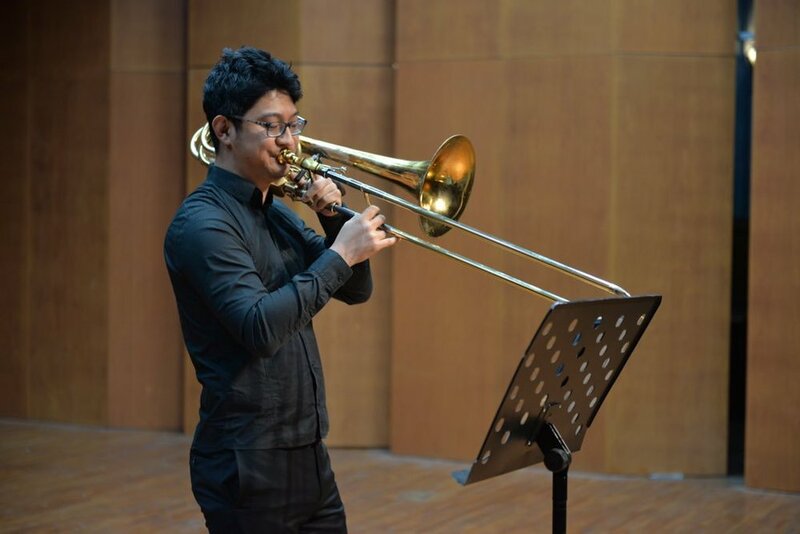 As a Brass Instrument Instructor, he currently serves as guest lecture at Northwestern University of Nationalities in China and also operates a private teaching studio, he also served as a faculty member at the first annual Wrobleski Low Brass Camp in August 2015 in Beijing, China. Mr. Sun earned his B.M. at Roosevelt University Chicago College of Performing Arts, M.M. and Diploma from Temple University. His main teachers include Jay Friedman, Charlie Vernon, Reed Capshaw, Blair Bollinger, Matthew Vaughn and Nitzan Haroz. As a brass instrument technologist, he designs, builds, and repairs brass instruments and has served musicians from the Chicago Symphony, Philadelphia Orchestra, Boston Symphony, Beijing Symphony, China National Symphony and other major orchestras and music institution. He is the current owner of Ultimate Brass Repair in Beijing. Mr. Sun is a Denis Wick performing artist.